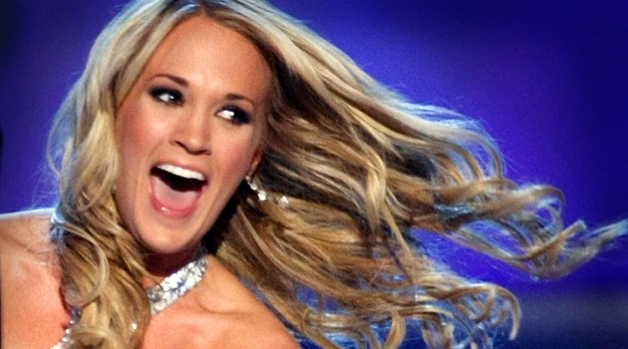 The country star won her third video of the year award. Singer Carrie Underwood performs at the 2012 CMT Music. She won her third video of the year award. Nashville's Bridgestone Arena is turning into quite a memorable place for Carrie Underwood and her hunky husband, NHL star Mike Fisher. Underwood won her third video of the year award at the CMT Music Awards on Wednesday night, carving yet another great memory out for the couple in the home of Fisher's Nashville Predators. "I think we live here," Underwood said backstage after winning the night's top honor. "We need to like rent a room here so we can sleep here, too." Underwood's two wins — she also won for collaboration of the year for "Remind Me," with Brad Paisley — mean she's now won nine CMT belt buckles since 2006. She matched Taylor Swift's run in the fan-voted video of the year category over the same period. 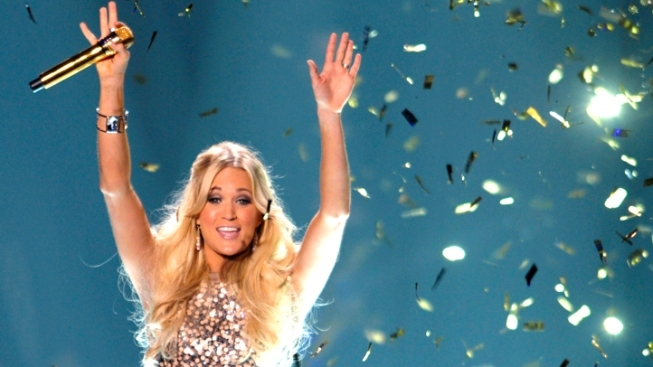 The former "American Idol" winner was the night's only multiple winner, and her fans did it for her again. "They're the ones in control," Underwood said. "I have a really active fan base. The people who come to my concerts and support me, they really get out and they do stuff. They vote. Any polls or any awards show, anything that they have control of, they're all about it." Luke Bryan pulled off the surprise of the night, taking male video of the year for "I Don't Want This Night to End." After beating out country's top male stars, Bryan briefly covered his face with his hands, then pogo-jumped his way to the stage. "When you're at this level of what we do as singers, and your fans vote, it speaks huge volumes and it's crazy to be fan-voted for an award and win it," Bryan said. "I don't really get caught up in trying to be cool, trying to play a part. I just freaking get so excited about this stuff and I will always enjoy it." Bryan rewarded his fans by mimicking his actions when he won his first CMT award two years ago. Back then he tossed a jacket into the crowd. This time he went cheaper, asking Tom Arnold to pull a pair of camouflage boxers wedgie-style out of his pants and tossed them into the crowd. "I threw my jacket off the stage and it was really expensive," Bryan said. "I think it cost something like $4,000, and a lot of people were like, 'Why did you that?'" It was far from the raciest moment of the night. Kellie Pickler pretended to motorboat an imaginary pair of breasts to introduce Little Big Town's performance of "Pontoon," complete with a full-sized pontoon boat and bikini-clad "swimmers" floating around the stage. And co-host Kristen Bell made sure to spend a little quality time in the stands, sandwiching herself between Bryan and Jake Owen. "I didn't know I'd be sitting right in the middle of Hunksville, Tenn., population — two," the actress joked. As for the official business of the night, the rest pretty much held true to current award show trends. Upon hearing their names in the collaboration category, Paisley leaped to his feet and wrapped his arms around Underwood's husband in a long embrace that got the laughs started. Miranda Lambert won her third straight female video of the year award for the emotional "Over You," a song she co-wrote with husband Blake Shelton about the untimely death of his brother. The win marked another emotional moment involving the song and its video, which was shot just weeks after Lambert lost her father-in-law, a close friend and her childhood pet. Video director Trey Fanjoy also lost her father just four days before the shoot. "Behind the camera and in front of the camera, the whole video was just trying to hold it together," Lambert said backstage. Rising duo Thompson Square was nominated twice for duo video of the year and won for "I Got You." Former "American Idol" winner Scotty McCreery took home breakthrough video of the year for "The Trouble with Girls" just hours before his high school graduation ceremony in Raleigh, N.C. Lady Antebellum won group video of the year for "We Owned the Night." And Jason Aldean, a multiple nominee in the past, won his first belt buckle, taking home CMT performance of the year for "Tattoos on This Town." "This is actually my first one of these, so this is pretty cool," Aldean said after double-timing it to the stage. "I've got to say a big thank you to CMT for still playing videos. Thank you guys so much. It's such an important part of what we do, and how to get our face (out there), and still connect with our fans." The night started with President Barack Obama and his likely Republican challenger Mitt Romney making an appearance in taped video segments. Like you might expect, neither was willing to offend voters on either side of the aisle in a "dirty politics" debate over who should host the show, Bell or country star Toby Keith. "This is one of the toughest decisions I've had to make since I've been in office, but I decided I want them both," Obama said. Romney then also suggested they work as co-hosts and added, "See, I just put two people back to work." With the decision made, Keith and Bell arrived at the stage in a huge replica of a red solo cup, in deference to Keith's hit song. The night was filled with several strong performances, but none got quite the reaction of Willie Nelson's rare appearance to play his new song, "Roll Me Up." Keith, Jamey Johnson, Darius Rucker and Zac Brown Band joined him on stage to sing the ode to marijuana as a smoke machine rolled on high in the background. Lady A singer Charles Kelley sang along, holding his cup in the air, and the performance received a long standing ovation. In a couple of other notable mashups, Paisley joined Hank Williams Jr. on a new outside stage to perform their collaboration "I'm Gonna Get Drunk and Play Hank Williams" and Journey joined Rascal Flatts on "Banjo" and "Don't Stop Believin'" to close the show. Lambert also performed "Takin' Pills," with her trio Pistol Annies. If references were counted, Lambert, Angaleena Presley and Ashley Monroe would have been the big winners. Bell even performed her own audition for the group. "We've already named her Hollywood Annie," Lambert confided. "We just haven't told her."